Soak Chickpeas in water for 1 full day (24 hours). Wash and drain on the next day and wrap it in a cotton cloth and keep it aside for another 24 hours. If the cloth dries out completely sprinkle some water on the cloth in between. Also if you get bad smell from the Chickpeas, wash them and put them back in the cloth wrap. You could see the sprouts on the third day. Soak Barnyard millet 2 hours before making Adai dosa. Wash once or twice and drain the water. Transfer it to the mixer grinder. Add Asafoetida and Pepper seeds in it and grind together to a coarse batter. Add some water if required. Transfer the batter to another bowl. Add chopped Curry leaves, Coriander leaves, Onion and Rock salt and stir well. This batter should be in Dosa batter consistency. So adjust water content accordingly. Heat a tawa and pour the batter on it and spread it like Dosa. Cover it with lid and cook for few minutes. Then turn the side and cook that side as well until the brown spots appear on the top. Remove it from tawa. Eat the Adai dosa with any Chutney or Vegetable aviyal/kurma of your choice. 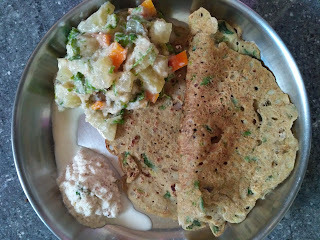 I have learnt Millet Pesarattu dosa in Nalla Unava’s Millet cooking workshop where they used Millet and Green gram. Pesarattu is basically a recipe from Andra Pradesh where the batter is prepared only with Green gram. Similarly, Adai dosa is a recipe prepared in Tamil Nadu with Rice and multiple lentils/dals. I have taken few points from these two recipes and tried this Barnyard Adai dosa recipe in accordance with Life Natural principles. The dosa came out well. Chickpeas takes minimum two days to sprout. So you have to plan the menu accordingly and soak the Chickpeas. You may also use any other pulse to make similar Adai dosa. The sprouting time will differ for each pulse depending upon the region we live. So try it yourself and find out the time required for each type of pulse. Always remember to use any one type of sprouts only as Life Natural recommends. You may add vegetables of your choice which are finely chopped and sauted without oil in batter. The dosa batter consistency can be made either thin or thick. You will get crispy dosa if the batter is slightly watery. If the batter is thick, you will get thick dosas like Uthappam. As mentioned in point no.1, I have also made Pesarattu using only Sprouted Green gram. It came out well too.